During a most recent trip to Paris , I took the #85 bus to Les Puces de Clignancourt for a visit to “Marché aux puces,” which literally translates to– you guessed it– “flea market”. The largest Paris flea market is located in St. Ouen and was established around 1870. The name of this market is rumored to have earned its name because of the ostensibly flea-infested furniture and other wares sold at the market just outside of the city’s northern fortifications. Years later, Pablo Picasso used the markets for walks of inspiration. Woody Allen even used the ‘puces’ for some scenes in his “Midnight in Paris” film. Claiming to be the largest of its kind in the world, the St. Ouen Flea Market attracts more than 11 million visitors per year and boasts over 2,500 stalls ranging from antiques to fashion, minus the fleas. As you begin to explore the area, you may notice that the outskirts of the market is flagged by terrible knock-off and other items easily found out the local dollar store or super-center. Just walk through these aisles and you will come into the more traditional flea market one expects to find here. Maps of the markets can be find below. In addition to this most famous of the “puces”, Paris counts several other fascinating markets to peruse and stroll. The possibilities for eccentric finds are nearly endless: you might happen upon old, charming ​knickknacks, records, clothes, books, eccentric quills or prized antique items. It’s one of the free Paris attractions that the budget-minded traveler should definitely add to their itinerary. 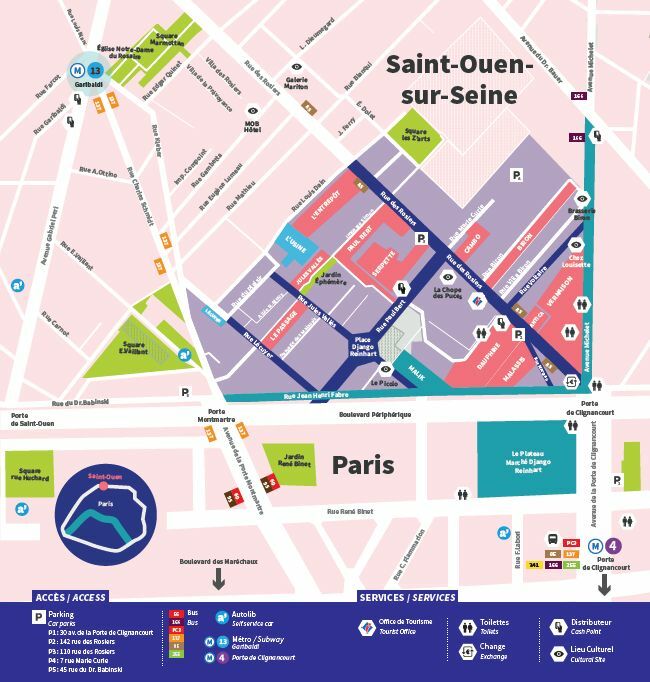 Address: Get off at Metro Porte de Clingancourt (line 4) and follow the signs to the market. The market lies between Paris’ 18th arrondissement (district) and the northern suburb of St Ouen. Hours: Open Saturday, 9am to 6pm; Sunday, 10am to 6pm; and Monday, 11am to 5pm. Entry is free. Some other choices for markets (non-food) to explore during your next visit to Paris. Please note that most of these markets are open ONLY on the weekends with some open on Mondays.